Who won the elections? The Republicans! Well, yes. But the real winners were yet again the no vote party. 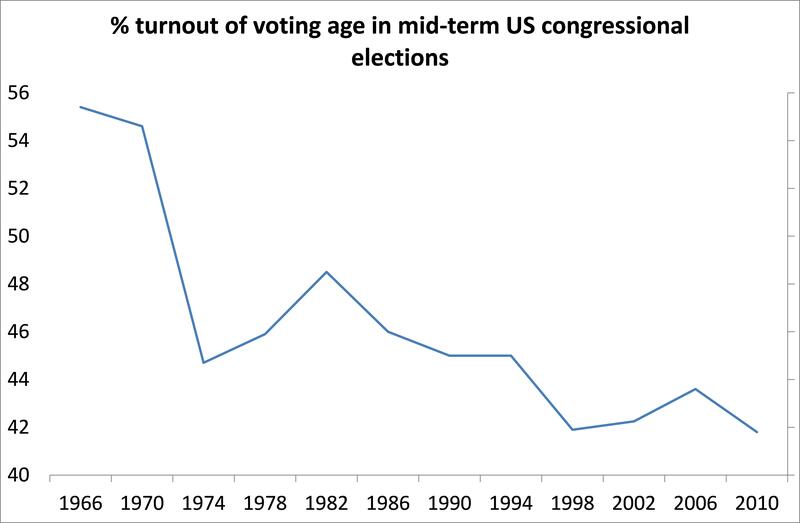 We don’t yet have the turnout of voters for the 2014 mid-term Congressional elections, but it is probably around just 40% of those of voting age. That means that 60% of adult Americans did not reckon that it mattered who won. A plague on both your houses – Republican or Democrat; Senate or House – that was their’ cry. This is the real message of the election. For most voters the failure of the Obama administration to restore the incomes of average Americans since the end of Great Recession in 2009 is only matched by the incompetence and downright complacency of the previous Bush administration to see the slump coming and do anything about it, except to bail out the bankers and other crooks who triggered it. There has been a steady disillusionment with their ‘democratic’ representatives for several decades. Back in the 1960 and 1970s, more than 55% of potential voters turned out in the mid-term elections. In 2010, despite new technology, better regristration and postal voting, that percentage reached a record low of 41%. If we just consider those eligible to vote and exclude ‘non-citizens’ and prisoners, there has been a similar fall in voting shares, in both presidential and congressional elections. Despite the optimistic noises from the media of a ‘high turnout’ in some areas, I reckon that the 2014 election is likely to reveal a new low, or something close. This will be especially so in the strong Democratic states like California and New York (36%), where working-class disillusionment with Obama’s compliance with the bankers and the rich, while living standards stagnate or even decline, has been strongest – although Republican Arizona polled just 36%. The ‘democratic deficit’ gets wider. This entry was posted on November 6, 2014 at 7:24 am and is filed under capitalism, economics. You can follow any responses to this entry through the RSS 2.0 feed. You can leave a response, or trackback from your own site. The ‘democratic deficit’ gets wider – With these words ist said it all! Some of that “no” vote has nothing to do with wishing ” a plague on both your houses.” The strategy of the RWM (rich white men) has been to prevent poor people, single-parent (women), students, black people (especially black people) from being able to vote. The only voter fraud in the US is anti-voter fraud. Voter ID laws are the new poll tax. Next up for the US bourgeoisie? Repealing the 13th, 14th, 15th amendments and paying reparations, not to the descendents of the slaves, but to those of the slaveholders. The increase of no party vote can be observed in some countries. But what could be the reason that people lose confidence in the elections? Could it be that the governments concerned do not keep their campaign promises and that’s why people are frustrated? Could there be another reason? 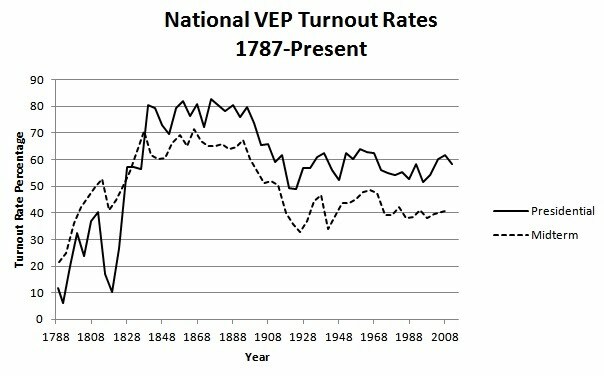 Voter turnouts have been at low levels for years, with the trend clearly being for lower participation. Part of this is disaffection; and a major part of this is designed. Since 1968, the Republican Party has actively pursued disenfranchising voters as a strategy as the heir to the legacy of Jim Crow. The Democrats, of course, although making much of registering voters, and “defending” the “right” to vote, are more interested in “triangulation”– finding the “sweet spot” that appears “liberal” without threatening the status quo. For at least the last 10 years, the Rove/Roberts/Koch strategy has been to buy every election you can; and to “insure” that investment by making it difficult for those unRWMs (rich white males) to make it to, or through, the voting process– hence the sham voter ID laws. Then you have Obama himself doing things like accelerating the deportation of undocumented people; increasing workplace raids to round up the undocumented……….things like that that don’t sit particularly well with Mexican-Americans. Hi Thank you, for your informative response. You seem to be very experienced in American history. I’m not very experienced and have heard in your comment for the first time of “sham voter ID laws”. There are a lot of criticism about this topic to read. And I’m actually not sure whether this shame voter ID law is still up to date? Or has it been revised? I agree the only thing is that I think that I read earlier that 70% of eligible voters are not registered. So the the national number of those who voted, 33.9% was of registered voters. In the part of the socialist/Marxist left I hail from, non-voting in the U.S. at least was never generally and fundamentally seen as in any way “progressive”, as in an implied “no” protest vote. Rather, it is seen as a hallmark of the relatively backwards consciousness of the U.S. working class. That characterization remains true until proven otherwise. It is not as if there aren’t any reformist/progressive/left parties or individuals on the ballot – there are! So no excuse for not voting, except per above. Now if someone actually organized a “Boycott the 2 capitalist parties” movement that had measurable effect, the above characterization could change. Otherwise low turnout is merely a register of the general demoralization of the present political regime. It measures, not the alienation of the masses from that regime – they’ll always have the opportunity to pledge an allegiance to the regime more heartfelt than any ballot, at the next football game, as the USAF flies overhead! – but their alienation from their own social selves. Not to beat this horse to death; but I agree with Matt. An essential part of Maoist theory points to the fact that democracy does not equal elections, but actually quite something else. Elections are some sort of act that persuades us that we are deciding on the policies of a country, but when the bourgeois organizations win an election, what they do is totally different. So there might be indifference from the public, it might be lack of consciousness, but I think elections as elections are no longer an answer to the struggle of the people. It is no longer something to struggle for. Your opinion is that reactionary politicians try to make the people to shy away from elections. What they are doing is to bury democracy deeper. I would like to draw attention to the propaganda machinery of the Israel reactionaries. They have made all the jew people feel that strong rejection against the Palestinians. This kind of propaganda machinery is pervasive and the bourgeois people are relying on it more and more. Is it because the consciousness of the people is backward? That’s not my opinion. Nobody regards elections as essential to class struggle, but a low voter turnout does not signify a “protest,” particularly in the US after all the laws designed to prevent black people, poor people, students from voting. That’s a fact; that drive to exclude people from voting has been going on for years. . I understand I made a mistake. And I totally agree with you Mr. Sartesian. Actually your analysis of the nature of elections is correct. Elections are games the bourgeois politicians play. They get the people out to vote, but in the end it is nothing but a show. Because the imperialist policies are deep down in the system and they are eternal. But the vote is a right of the people. And we have fought for that right for almost a century. So there is a contradiction. We try to get people out to vote, but democracy means direct channels of participation from the citizens. In the Maoist jargon: a people’s democracy. From disaffection, to a political boycott, there is a long way. A political boycott means the active leadership of a revolutionary organization. And there isn’t one today. So today we need to act inside the system, and immerse ourselves in the electoral process. But there is disaffection in the people because they feel that their wishes are not being fulfilled. While a lot of them just don’t care (because the imperialist system does work hard to make the people apolitical, filling therir heads with a lot of superfluous things), a lot of others sincerely consider that voting is a nonesense, and they feel that their nation is collapsing more into corruption, etc.